So very true, my friend! Have a lovely week! I love fall also. Enjoyed your post today. Much truth in it. I’m a retired teacher and always looked forward to the beginning of the school year. Excitement over a new start for kids and teachers alike. I don’t know if I love fall or spring most….. both are wonderful. I HEARTily agree…I love all of the seasons! (I finished typing my book for self publishing…i practiced with your helped and I think it turned out good..needs editing..Thank you. My cards I was working on disappeared..but I like what I ended up with. I will share with you. I have two sets at the other place ) Take care! Your words today prove to me how amazing you are! 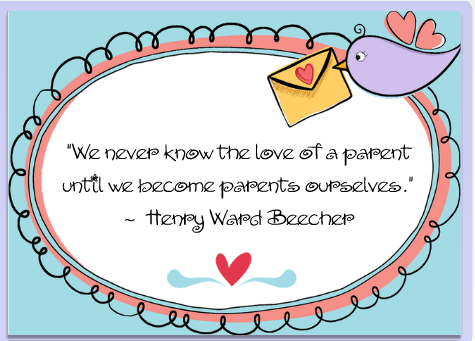 I may add for those of us who do not have children that you can also experience the joy of parenting in other ways. Caring for an elder, a pet, fostering a child, and caring for the community all have the same feeling and emotion. It is the practice of opening our hearts fully, allowing all to enter, good and bad, still seeing the inner beauty. Nurturing caring and loving. By the way Autumn is awesome. How wonderful that you love Fall and your children! Yes, they are precious gifts, aren’t they? ♥ Have a lovely renewing Autumn!